George H. Takei, the highly accomplished actor and tireless champion for the arts and social justice, received an honorary Doctor of Humane Letters Friday during Cal State LA’s Commencement. Students gave Takei two standing ovations during the ceremony. 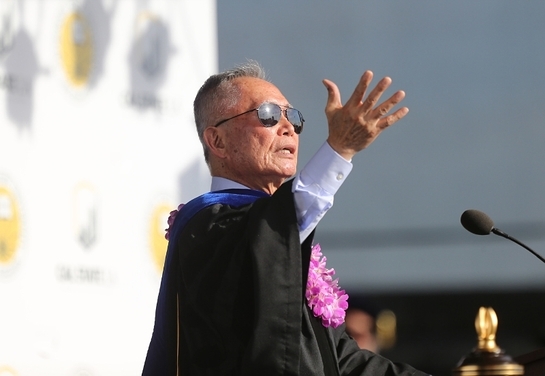 The 79-year-old Takei, who is best known for playing the character Mr. Sulu on the original, award-winning television series Star Trek, also delivered the keynote address during the undergraduate ceremony for the College of Natural and Social Sciences. His address was a prism into the trials and tribulations that Americans have endured during the 20th and 21st centuries. Takei recounted growing up with Mexican American families on Los Angeles’ Eastside, not far from Cal State LA. But that life was interrupted when World War II broke out. He and his family were among more than 100,000 people of Japanese ancestry in the U.S. who were rounded up and sent to internment camps. Living behind barbed wire at Camp Rohwer, in the swamps of Arkansas, and Camp Tule Lake, on a scrub-covered plain of northern California, left a lasting impression. Takei, who earned a B.A. and M.A. in theater from UCLA, has more than 40 feature films and hundreds of television guest-star roles to his credit. He boasts more than 9.7 million fans on his Facebook page and has used the platform to advocate on behalf of lesbian, gay, bisexual and transgender rights. He was a former board member of the Southern California Rapid Transit District and helped establish the Arts in Transit program, which led to each Los Angeles Metro station having its own distinctive artwork. He was appointed by President Bill Clinton to the board of the Japan-United States Friendship Commission and received the Order of the Rising Sun, Gold Rays with Rosette, from Japanese Emperor Akihito for his contributions to improving relationships between the two nations. In closing his Commencement address, Takei noted that the democratic process can be unruly, even unjust. But as Americans, he told the crowd, we have a responsibility to be engaged and to strive to make our country a better place for all people, regardless of their differences.